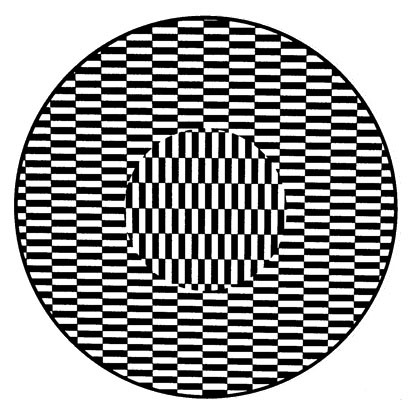 If you move your eyes or head slightly as you look at this pattern, the disc in the middle will appear to hover in front of the background and move. Try shaking your head or shaking the display if you are having trouble seeing the illusion. H. Ouchi, Japanese optical and geometrical art. Mineola, NY: Dover, 1977. A. Kitaoka, "On motion illusion in a stationary image", Jul. 5, 2005. [Online]. Available: http://www.psy.ritsumei.ac.jp/~akitaoka/TsukubaCOEsympo2005.html. [Accessed: Mar 27, 2010].